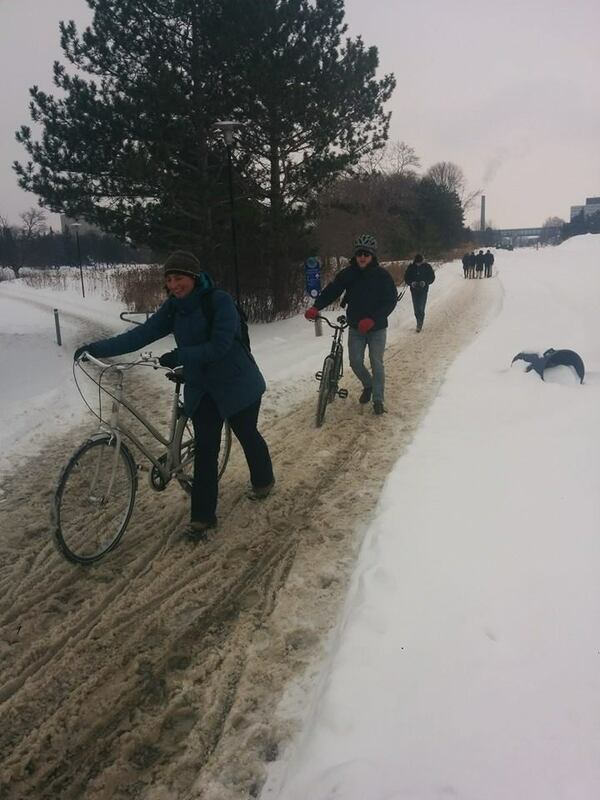 Below is Sylvia Hook modeling the Canadian Winter Cyclist look. The key is no exposed skin, particularly the face using a balaclava and ski goggles. Lots of layers to ensure warmth but you’ll note she also has the ability to quickly shed layers to avoid over heating. Sweating is the quickest path to hypothermia here in the north. 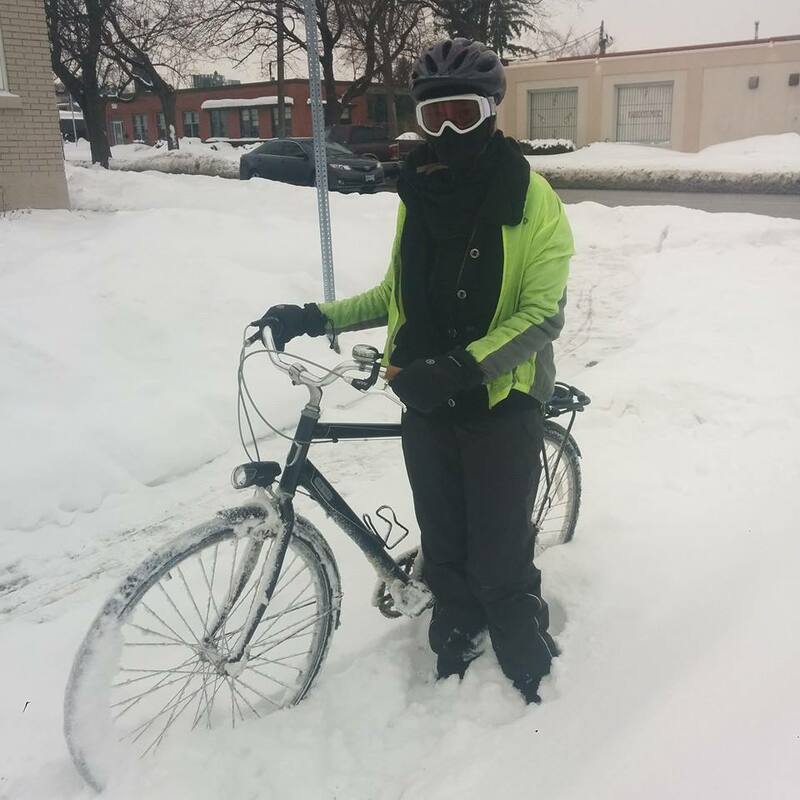 Sylvia also sports a great bike complete with a rear rack for carrying light loads, lights, fenders and studded tires for winter traction on icy roads. She’s a comfortable 365-day a year cyclist. The Waterloo Region Record’s Anam Latif captured the essence of why we road talking to Mike Boos and Sylvia Hook at the end of our ride. While CTV caught us before we left and included us in a clip of various ways folks in our community were out and about enjoying the winter. Here’s my view of the ride, I’m sure we all had a slightly different experience (map). Starting out on a group ride is always a bit chaotic, figuring out how to get everyone started, but once the train begins to move it’s an amazing experience. There’s safety in numbers and riding up King Street from Erb to University was so pleasant and relaxing as our group took over a lane and leisurely made our way north. Usually this stretch, especially in Uptown Waterloo is stressful as the cyclist has to fight for every inch of the narrow lanes. Can’t wait until we have separated infrastructure along this stretch. The grape-line tell’s me a vote is coming in late March or early April 2015. You’ll hear more from once the vote date is confirmed. As we headed west on University from King Street we all commented on the abruptness in which the bike lane suddenly ended just 40 metres after getting on University. It felt that as soon as you needed space on University, it was taken away and all 30 of us to signal left to take our space in the lane going past Wilfred Laurier. As we came to the Laurel trail at the University of Waterloo we hoped onto the side walk to make a left at the lights, its a confusing left for motorists as cars don’t view this as an intersection. The Laurel trail was probably the worst maintained section of our ride. We lost a few riders at this point as the trail was not rideable for some. 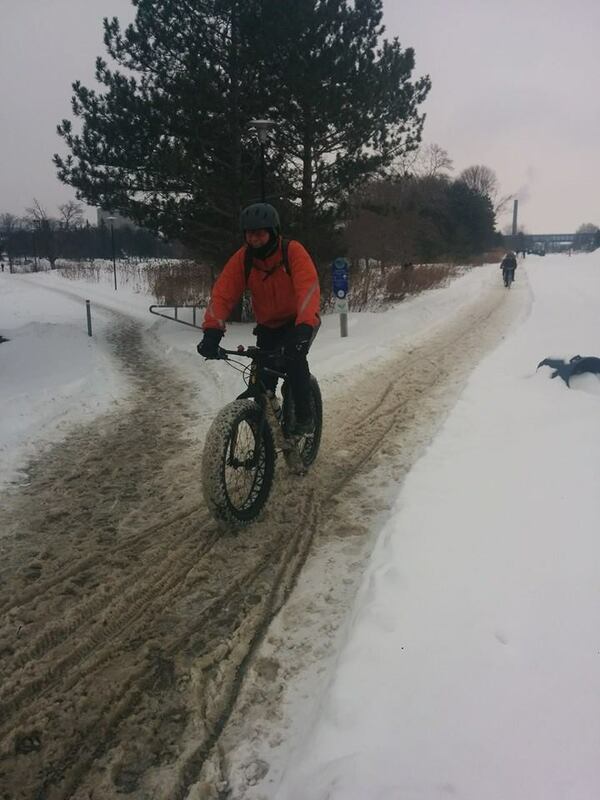 The only rider that had no difficulty was the Fat Bike commuter and it’s unfortunate when a public thoroughfare is only safe if you’re riding a Hummer. We continued south and joined up with the Iron Horse trail. Winter maintenance on the Iron Horse trail was fantastic, it was bare pavement the whole way down. We even passed a winter motorized wheel chair. It would have been impossible for him to have made it all the way to the University of Waterloo, his motorized wheel chair would not have made it through the Laurel trail. It made me realize that our trail system is about mobility and accessibility for everyone, not just cyclists or motorists. 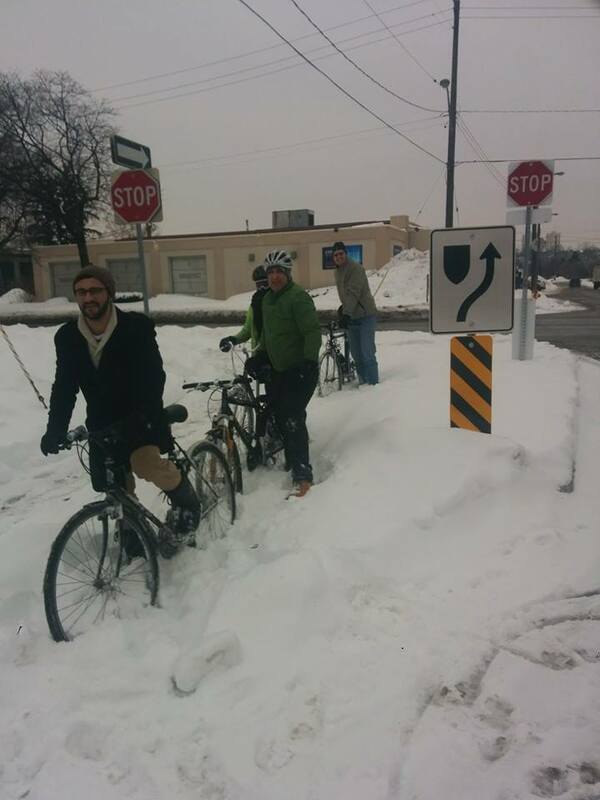 As a community we need to think seriously about winter maintenance standards. Who are these standards for? Just motorists? Or are they for people. I believe accessibility is a human right and that we can’t discriminate our standards for just one mode. It’s a shame that in winter a winterized wheel chair can’t traverse our neighbourhood sidewalks and city trail networks. We carried on down the Iron Horse, stopping to notice the fantastic rail crossing improvements near Victoria Park. What a joy to ride and also sad when you consider the numerous injuries that occurred here with even one cyclist losing their life. Note the before picture and the improvement clip. 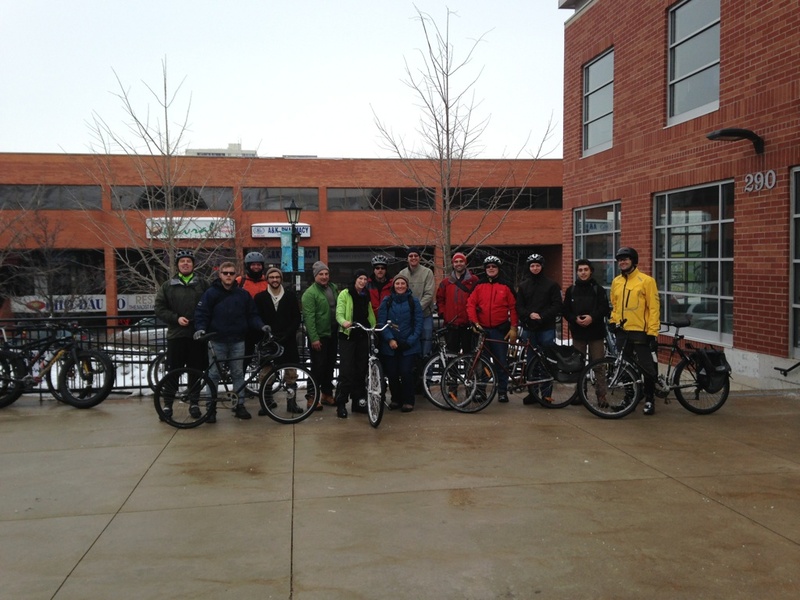 We took the Iron Horse trail to it’s end just to ride on Nybourg’s contra flow bike lane. You can’t see the contra-flow bike lane below cause it has two feet of snow on it, apparently it doesn’t get cleared (kind of typical of how bike lanes are used as winter snow storage). But the point of contra-flow bike lane is that cyclist can travel in both directions while motorists can only travel in one direction. After the symbolically riding the contra-flow bike lane we headed up Charles to Water Street to see how many of us could fit into the bike box. Yipee, it’s green unlike the unpainted bike box on Davenport in Waterloo (why they haven’t painted it yet is beyond me). We then rode proudly down King Street to the Kitchener Market, relishing our choice of beverage and lunch (I love the crepe place). 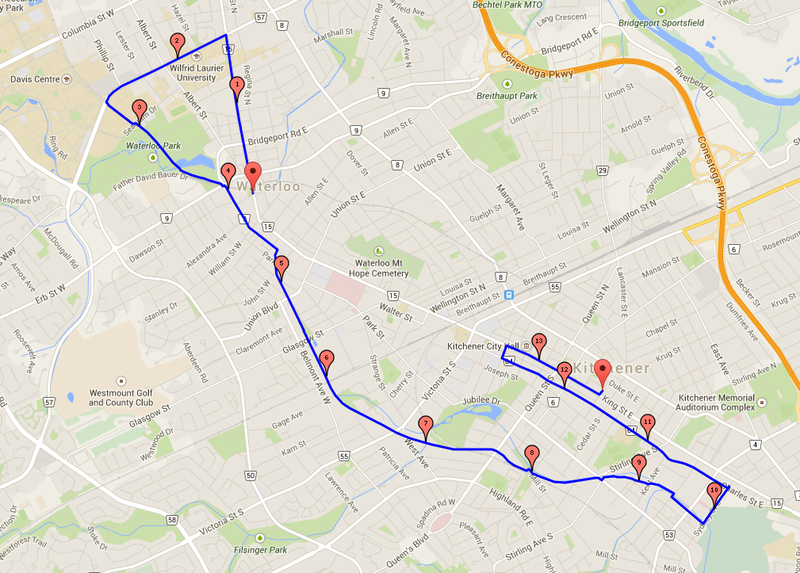 Next Next post: Winterloo – Winter Cycling Booth – Come Visit!